How will Wall Street react if the government shuts down — and is your 401(k) safe? A government shutdown could jolt the market’s rise, but investment experts caution against investors — especially those with long-term investments in retirement accounts — making any sudden moves, even if stocks do. In spite of the recent passage of tax cut legislation that helped propel the Dow Jones and S&P 500 indexes to record closes on Wednesday, the uncertainty on Thursday over whether Congress could avoid a shutdown was starting to creep in, with the Dow down 100 points at midday and the VIX “fear index” up slightly. “The market has been incredibly resilient to political drama over the past year,” said Scott Cole, founder and president of Cole Financial Planning and Wealth Management. Cole suggested, though, that this week’s volatility indicated that the market is sensitive to the current uncertainty in Washington. “We are due for a decent pullback, so a sell off wouldn’t be a surprise to me,” he said. “Any government shutdown that persisted into the work week would breed plenty of the type of uncertainty that can rattle investors' confidence,” said Greg McBride, chief financial analyst at Bankrate.com. "Markets have done nothing but go up lately. A government shutdown, even a brief one, could reintroduce investors to the fact that markets go down as well,” he said. Stephen Craffen, owner of Stonegate Wealth Management, said that while a government shutdown wouldn’t have a detrimental effect on corporate earnings, it could be the trigger for the correction market watchers have been predicting in recent months. “When it comes to the precipice of the cliff, small things can push it over the edge,” he said. “In the past, we haven’t seen that much change in the market when we’ve had a shutdown, but with the way the market is going — the melt-up — this could be a catalyst,” said Todd Minear, founder of Open Road Wealth Management. In general, investment professionals willing to make a prediction estimated that the market could drop in the short term in the low-to-mid single digits, but bounce back within a month if a shutdown takes place but is resolved quickly. 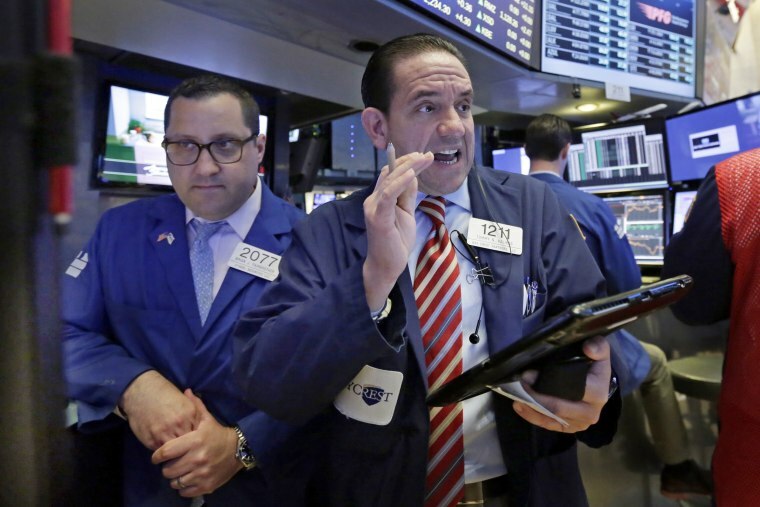 “If the market drops 5 percent in a couple of days, yes it’s a big headline number, but it wouldn’t be material because the market’s gone up so much,” said Andrew Feldman, president of A.J. Feldman Financial. Martin pointed out that past shutdowns haven’t had a crippling effect on stock prices, with the largest in decades being a 4.4 percent drop the market incurred during an 11-day shutdown in 1979. “We’re due for a correction, but we’re going to have two or three or more before people access this money,” he said. The experts were unanimous in one message: Don’t panic. Particularly for retirement savers, reacting to a fall in stock prices could do more harm than good. “Anyone with a long-term view — say, saving in a 410(k) — shouldn’t do anything to try to predict what the outcome is going to be,” said Joel Martin, a wealth adviser at Buckingham Strategic Wealth. Even pros who try to time the market often get it wrong, they warned — and losses in retirement assets can be especially damaging because of the multiplier effect that long-term investing delivers. “Don't get distracted by short-term volatility and be tempted to make decisions with 401(k) or other retirement account money,” McBride said. In fact, some financial advisers saw a silver lining to the prospect of a correction. “The biggest potential I see here is a buying opportunity,” Minear said. “If there is a temporary shutdown and the stock market declines because of that, if you’re someone who’s still saving that’s probably good news,” said Steven Elwell, vice president of Level Financial Advisors. “Every paycheck you hit that has 401(k) contributions go in is buying stock at a cheaper price,” he pointed out.